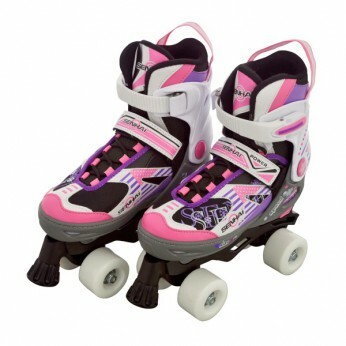 These quad skates feature PVC leather, mesh, velvet and soft foam inside. They also feature a front stopper, PU casted wheels 54 x 32mm, ABEC 1 carbon steel bearings and a push button that allows them to easily adjust size. Sizes are available in 29-32, 33-36 and 37-40. Helmet and safety gear sold separately…. This toy costs approximately £34.99 (for the latest and best prices make sure you check our retailer list for the Quad Skate Pink/Purple (Size 37-40) above). In our review of Quad Skate Pink/Purple (Size 37-40) we classed it as being suitable for ages 6 years, 7 years, 8 years but recommend you check the manufacturer specific advice before purchasing.